The University will be operating under its Green Days and reduced occupancy schedule format for the Winter Break period fro m 5 p.m. on Friday, Dec. 22, through Tuesday, Jan. 2, 2018. • All academic and administrative buildings will be locked or closed. • Building temperatures will be lowered to 60 degrees, unless prior arrangements have been made. 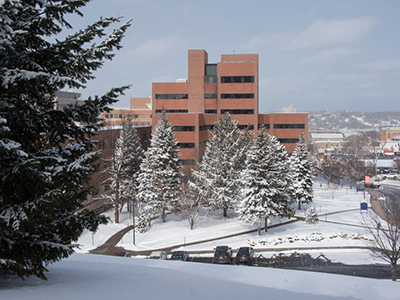 Deans, directors and department heads may submit a detailed request for adjustments to temperature and lighting during the Winter Break/Green Days period. Please review the University’s temperature guidelines. We ask that requests be made using the online form by 5 p.m. Tuesday, Dec. 19. Requests will be reviewed and approved by either the vice president and chief facilities officer or the provost. • Bird Library—Operating hours are listed on the library website. Questions on building occupancy can be directed to the Department of Energy Systems and Sustainability Management, 315.443.6195 or energy@syr.edu. Thank you for your continued support of the University’s sustainability initiatives.